One Stop for Your Dental Implants! Cold Spring Family Dentistry not only installs the crown (or tooth portion) of the implant but also places the implant itself. Many dentists send their implant patients to an oral surgeon to have the implants placed. Our dentists have had hundreds of hours of training and experience with implants so our patients receive the best and most up to date care available. Dental Implants are a new and better solution for missing teeth that were previously repaired with bridges and dentures. 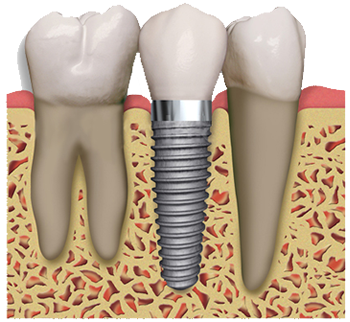 A Dental Implant is an artificial root made out of titanium. These implants are replacement tooth roots that are permanently inserted into the bone. Implants look and feel like your own natural teeth. Improved speech as you have nothing that can come loose in your mouth. Comfort as they are a part of your mouth. No worries about eating the food you love. Oral Health and Convenience, Easier to clean or brush your teeth, no need to remove dentures or use adhesives to keep them in place. After your dental professional examines you and determines you are a candidate for Dental Implants a titanium post is placed into the jaw bone area of the missing tooth. The jaw bone will heal around the implanted titanium post to secure it in the jaw. This process usually takes about 4 months.While the implant is healing a temporary tooth can be placed over the implant so that you can smile normally. Once the implanted post is secure an abutment is attached to the post to hold the new tooth. A digital image is taken and a new replacement crown is created that matches shape and color of your teeth. The crown is installed and fit to the abutment. Dental Implants require the same care as your natural teeth. Normal brushing, flossing, rinsing with mouthwash and regular dental checkups. I would strongly recommend having a dental implant. To my surprise there was no pain during or after the procedure. I love the fact it acts and feels like my own teeth.